The hardest part about making "dino bones" is procuring the dinosaur. I'd only ever had dino bones once and that was this past summer on our trip to Louisville. They were huge, meaty, but more importantly, had a rich flavor. I loved them and vowed I would make them soon. It took longer than anticipated, but soon is now. 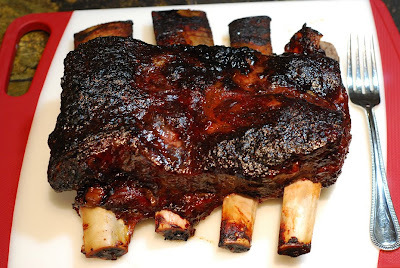 Dino bones are huge beef ribs barbecued for hours. 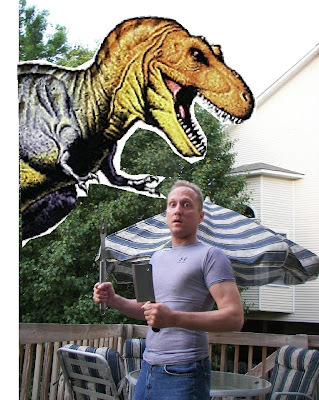 I was confused about what cut dino bones were actually from. Some people and places say they are beef back ribs, the part cut off of a prime rib to make ribeyes. 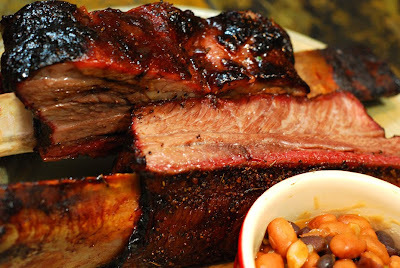 Other folks and sites said that dino bones come from beef short ribs. So I consulted the good folks over at the BBQ Brethren and found out that either is acceptable. Beef ribs are hard to come by in Knoxville. Mainly because true butchers are hard to come by in Knoxville. So I went and saw Scott Lynam at Lay's Market. I told him what I was looking for and he knew exactly what I needed, finding us a very nice uncut beef short rib. Lay's Market is 12 miles from our house and by no means convenient, but he treated me like a regular and has won my family's business. 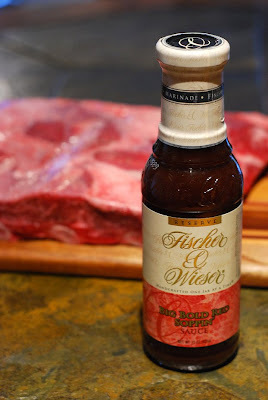 This also gave me the perfect opportunity to try out the free sample (see disclaimer at top) of Big Bold Red Soppin' Sauce that I received from the folks at Fischer and Wiesner. 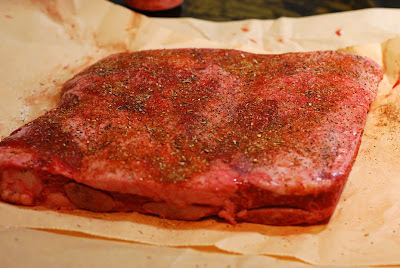 Rub the ribs with the salt, pepper, and beef rub. Cook for 4 to 6 hours. Using a clean brush, baste every hour with a portion of the Big Bold Red Soppin' Sauce. The purpose of using separate batches is to prevent cross contamination. The ribs will shrink back on the bones very drastically, don't panic. It's supposed to do that. When you're ribs have pulled back about 50% on the bones and have an internal temperature of 195-200f, they are done. Remove and let rest for 15 minutes. Slice into rib portions. 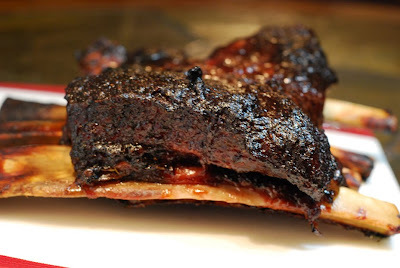 Unlike pork ribs, one beef rib is a normal serving size. I seasoned both sides of the ribs and then left them out while I got the Big Green Egg up to temperature. 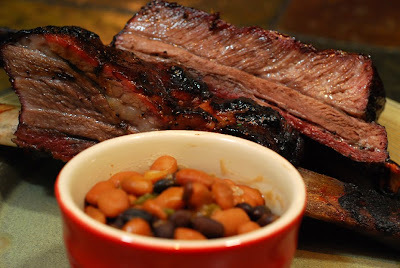 Shrinkage can be a good thing, when it comes to BBQ. That's the toughness leaving and all the goodness staying! I placed the fork in the picture for scale, these are some pretty big assed ribs, kind of like the ribs that flip the car in the opening credits of The Flintstones. Hence the name. Much like brisket, these will turn very dark. They will be mostly blackened but not burned at all. The Big Bold Red Soppin' Sauce was not a thick, tomato based BBQ sauce. It is a thin and beautifully tart sauce to be applied during the cook. In fact I used it more like a mop, than a sop and that worked, building multiple layers of flavor instead of one big "hit" of it during the last few minutes of cooking. There are not too many sugars in it so it doesn't burn like BBQ sauce would. The sauce would actually be a good marinade for steaks and a sopping sauce for brisket too. You can order Fischer and Wiesner products online or find them in retail locations. I know that Earth Fare in Knoxville carries some of their products. For more information on soppin' sauces and recipes for making your own, check out this page. We were very happy with the ribs. The flavor was excellent. I had just the right about of smoke on them. Alexis and the boys loved them.